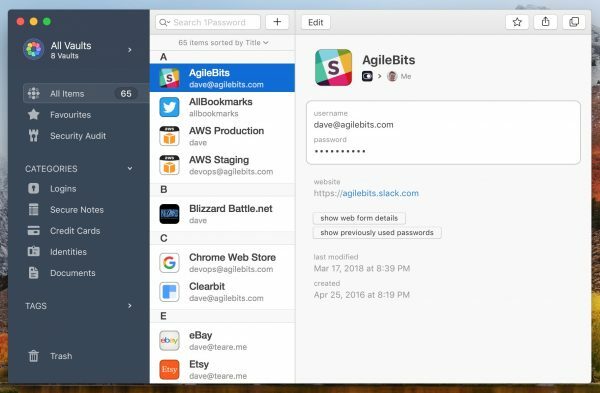 AgileBits has released beta versions of its upcoming 1Password 7.0 Beta for Mac and 1Password 7.0 Beta for Windows clients. 1Password offers secure form-filling and password management tools and is also available on iOS and Android. The beta showcases several major new features, with Windows gaining a handy new sidebar view to ape the Mac version, which sees its own sidebar improved along with a host of other new additions and feature improvements. 1Password 7.0 for Windows comes with the promise of a major new redesign to tie it in closely to the Mac client. This includes the addition of a handy sidebar, which comes in particular handy now the client supports multiple vaults for storing data. The new release also adds support for Windows Hello, allowing users to unlock their vaults with their fingerprint or via facial recognition. 1Password mini -- the browser add-on -- has also been given a design refresh, while a new Large Type view for displaying passwords help users when having to manually input passwords themselves. 1Password 7.0 for Mac gains a facelift too, with its sidebar now coloured using a dark theme and monochromatic icons to minimise distraction. All vaults are now visible in sidebar view, allowing users to drag and drop items between them (or into 'New Vault' to create one from scratch). Vaults can now be edited easily from the sidebar too. Secure notes gain rich formatting using Markdown language and tags can now be nested. Users can now also "pop-out" items for permanent pinned access, making them easy to access across a variety of apps. Other improvements include being able to check passwords against a 500-million-strong database of exposed passwords, while Touch ID support is tightened with Secure Enclave, which protects the encryption keys using the local Mac's own hardware. The Safari app extension is now built into 1Password 7.0 itself, and the app has been re-engineered to run within a single process. Other updates and improvements can be seen at the program's change logs, revealing it's already up to Beta 5. 1Password 7.0 Beta for Mac and 1Password 7.0 for Windows are both available now for download, and are free during beta testing. Licenses vary according to platform, and existing users will need to pay $64.99 to upgrade to version 7.x when it's released -- however, by enrolling in the beta program, they'll be able to upgrade for the specially discounted price of $39.99.